The event continues for 48 days. The Kumbh Mela is a unique festival held once every 12 years in Prayagraj, Nashik, Haridwar and Ujjain. The event sees millions of religious saints and sadhus, as well as people from ordinary walks of life, congregate in one place. Read on to find out more about how this event came about and the rituals associated with it. Once in every 12 years, the air over Prayagraj or Allahabad, as it was earlier known, is filled with the chanting of Vedic mantras, the smell of flowers and the feeling of devotion as people from across the world gather to celebrate the Kumbh Mela. The Kumbh Mela 2019 begins on Makar Sankranti, January 15th and continues for 48 days till March 4th. According to Hindu mythology, the Kumbh Mela originated from the story of a curse by the Durvasa Muni on the Demigods. When the Demigods lost their strength because of the curse they approached Lord Shiva and Lord Brahma for help. They were advised to turn to Lord Vishnu who asked them to churn the Ksheer Sagar or ocean of milk. This would help them get the ‘Amrit’ needed to regain their strength. The Gods feared that drinking Amrit would make the Demons immortal and thus when the pot of Amrit appeared, Jayant, the son of Lord Indra was told to take the Amrit away. This led to a battle that raged for 12 days and 12 nights. It is believed that one of these days is equivalent to 1 year. 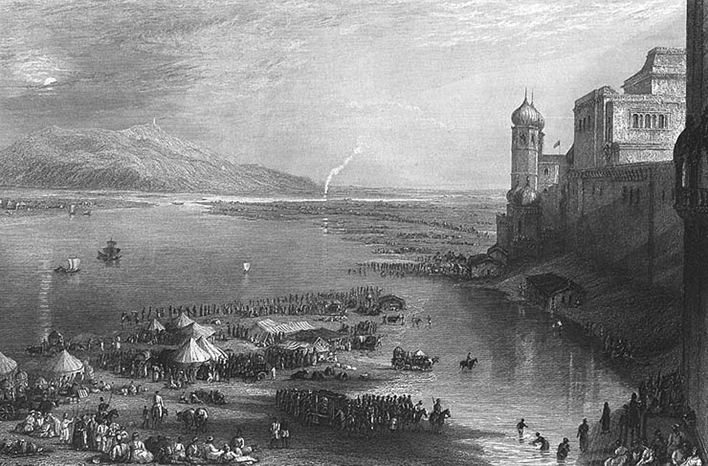 During the battle, a few drops of the Amrit fell to the earth in Prayagraj, Haridwar, Nashik and Ujjain. So, once in every 12 years, a Kumbh Mela is held in each of these places. In addition to this, the Maha Kumbh Mela is held once in every 144 years at Prayagraj. The Kumbh Mela is held once every three years in the Ganges in Haridwar, the confluence of the Ganges, Yamuna and mythical Saraswati in Prayagraj, the Godawari in Nashik and the Shipra in Ujjain by rotation. At any one given place, the Kumbh Mela is held at intervals of 12 years. Apart from this, there are three other types of Kumbh. The Ardha Kumbh Mela: This is held in Haridwar and Prayagraj once in 6 years. The Purna Kumbh Mela: This is held only at Prayagraj once in every 12 years. The Maha Kumbh Mela: This is held only in Prayagraj once in every 144 years. The Kumbh Mela attracts people from all sections of the Hindu society. Members of various religious denominations make up the majority of the gathering. This includes the naga sadhus, hermits, priests, members of various religious organizations and their disciples. Bathing in the confluence of the Ganga, Yamuna and Saraswati rivers is the main ritual associated with the Kumbh Mela. While the Ganga and Yamuna rivers can be seen by the naked eye, the Saraswati is believed to be an invisible river that surfaces only during the Kumbh when sacred hymns are chanted. This is accompanied by other religious activities such as the feeding of holy men and women, religious assemblies and discussions and pujas. During each Kumbh Mela, millions of devotees take a dip in the confluence or Sangam. This is a sacred ceremony that is believed to purge one of all the sins committed and to release the individual and their ancestors from the cycle of rebirth so that they can attain Moksha. People may take a dip in the water on any day of the Mela but there are some days that are considered especially auspicious. 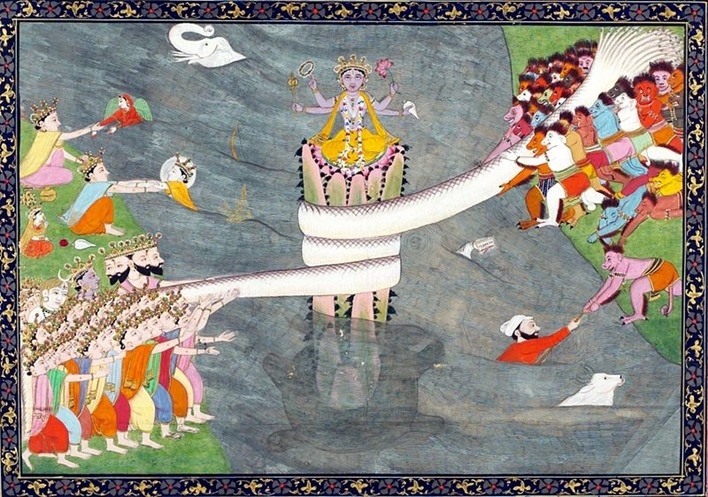 On these days, the religious men and women and their devotees are the first to enter the water. Devotees perform this ritual with a great procession and a lot of fanfare. 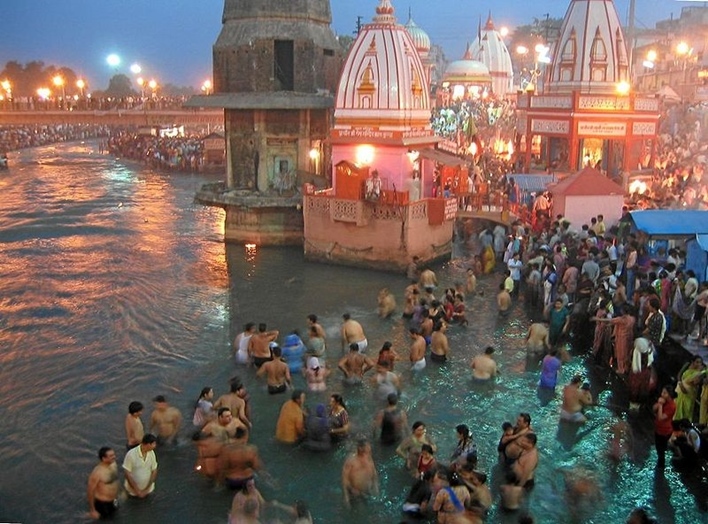 The general public can enter the water only after the Sadhus and their disciples have completed their dip. During the Kumbh Mela, an Aarti is held every morning and evening on the river banks. This is performed to show devotion to the rivers which are believed to be lifelines for humans. The gathering at these aartis often reaches several thousand people. On special days, lakhs of visitors may take part in the aartis. The lamps used for these aartis are considered to represent the panchtatva. While the flames of these lamps signify bowing down to the sacred rivers, the fumes emanating from these lamps symbolize the mysticism of heaven. A visit to the Kumbh Mela isn’t just about taking a dip in the Sangam. You must also arrange transportation to and from the Mela, your stay and other administrative details. Read on to find out more. Though the Kumbh Mela has a spiritual heart, it does have a noticeable economic impact. The 50-day Mela was allocated a budget of Rs 4,200 crores by the UP government and is expected to generate a revenue of about 1.2 lakh crores. Incidentally, this is the most expensive Kumbh Mela till date. The last government spent on Rs 1,300 crores on the 2013 Kumbh Mela. The preparatory work for the Kumbh Mela 2019 began in late 2018. The city of Prayagraj was given a complete facelift with the building of 300kms of new roads, 22 new pontoon bridges and a number of new flyovers. Paintings of themes from religious scriptures along the roads and planting of trees contributed to beautifying the city. A number of developmental projects were also undertaken to create temporary infrastructure in the Mela grounds. Keeping in mind the stampede that broke out in 2013 when a foot overbridge collapsed, the Indian railways has built new infrastructure worth Rs 700 crores at the Prayagraj junction. This includes a skywalk, five foot over bridges, a new platform and four enclosures that can house up to 10,000 people every night. For the duration of the mela, 800 special trains, 6 luxury trains and four trains reserved exclusively for NRIs will be run. A number of trains will also be temporarily rerouted to include a stop at Prayagraj. 500 special shuttles have been started to ferry pilgrims from the railway stations and bus stands to the Kumbh Mela grounds. There are two direct trains between Bengaluru and Prayagraj. In anticipation of the number of people who would want to attend the Kumbh Mela, a new airport was constructed at Prayagraj. The airport can handle up to 300 passengers at a time during peak hours and was built within 11 months. This is the fastest construction by the Airports Authority of India. 108 flights operate at the airport every week. Air India, Indigo and Jet Airways all operate regular flights between Bangalore and Prayagraj. Of these 48 flights operate between Bangalore and Prayagraj. There is no dearth of accommodation for the Kumbh Mela. Pilgrims can choose between staying at hotels, Dharamshalas, guesthouses and the four tent cities set up for the event. Rs 65 crores was spent on building tent cities around the Kumbh. Accommodation choices at the Kumbh vary from dormitories to luxury tents with high-tech facilities.